BERKELEY – It took senior Asha Thomas 40 minutes to make a field goal on Thursday night. 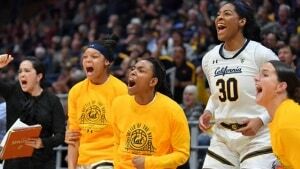 Thomas’ driving layup as time expired lifted the Cal women’s basketball team to an 81-80 victory over No. 8 Stanford at Haas Pavilion. Thomas, who entered the night averaging 10.9 points per game, didn’t get on the scoreboard until her two free throws put the Bears (14-6, 5-4 Pac-12) in front 79-78 with 9.5 seconds to play. The Cardinal went ahead on a pair of free throws with 7.2 seconds left that were a result of star Kristine Anigwe’s fifth foul. Without Anigwe, who dominated with 25 points and 24 rebounds, Thomas made the game-winning play. She found an opening in the lane and laid the ball off the glass with her left hand. After caroming off the rim three times, the ball fell through the basket as the horn sounded. It marked Cal’s second straight victory over its rival, following up its 78-66 win over the Cardinal last February. The win was also the Bears’ first over a ranked opponent this season and first over a top-10 opponent at home since 2009. Not only did the Bears have to play the final possession without Anigwe, but starting guard Kianna Smith had also fouled out a minute earlier. But there were still other threats on the floor that Stanford had to defend – forward Jaelyn Brown and guard Recee Caldwell combined for 29 points. For the second straight game, the Bears made a season-high in 3-pointers. They went 12-for-30 from beyond the arc, with Brown converting on 4-of-6 and finishing with 18 points. Smith was also 4-of-6 from long distance and had 16 points while Caldwell was 3-of-7 and finished with 11. The Bears will face Stanford again on Saturday at Maples Pavilion. The game begins at 4 p.m. and airs on the Pac-12 Networks.